So you just rebranded and Barry from marketing says you need to change from Blue 7e61ea to Blue 616ce8. You can do that easily. 1) Highlight the text you want to modify. 2) Click the "underlined A" icon. 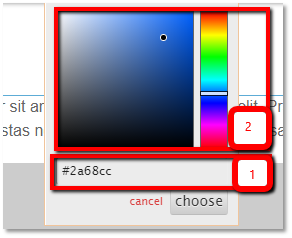 3) Pick the color you want by (a) typing it in directly or (b) using the slider/picker combo. Tip: Many of our partners like to use their company colors to include in their articles. If you'd like to do something like this, use your HTML color codes! 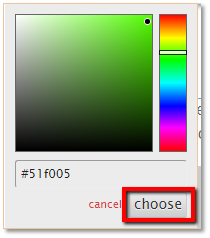 4) Once you've selected the color you want, click "choose." 5) Your font color will now reflect your choice.